Europe has turned into a war zone with a waive of arrests across the continent, two of which are related to the thwarted attack on Belgium. In all a total of over 25 persons have been arrested in counter Islamist terrorism operations. Nigel Farage says mass immigration has led to Muslim ghettos in Britain run under Sharia Law. UPDATE: Mass immigration has led to the growth of Muslim ‘ghettos’ in Britain which are run under Sharia Law, Nigel Farage declared last night. In an interview with US news channel Fox News, Mr Farage said the authorities had turned a ‘blind eye’ to the growth of ghettos where ‘the police and all the normal agents of the law have withdrawn and that is where Sharia law has come in.’ Communities Secretary Eric Pickles accused Mr Farage of ‘pandering to peoples’ worst fears’ and branded his comments ‘irresponsible and wrong’. In the meantime, the former boss of MI6 shows the double affliction in the postmodern elites. They have accepted the moral justification of the enemy (demoralization) and we are the evil people that must adapt to the others (altruistic Nihilism). 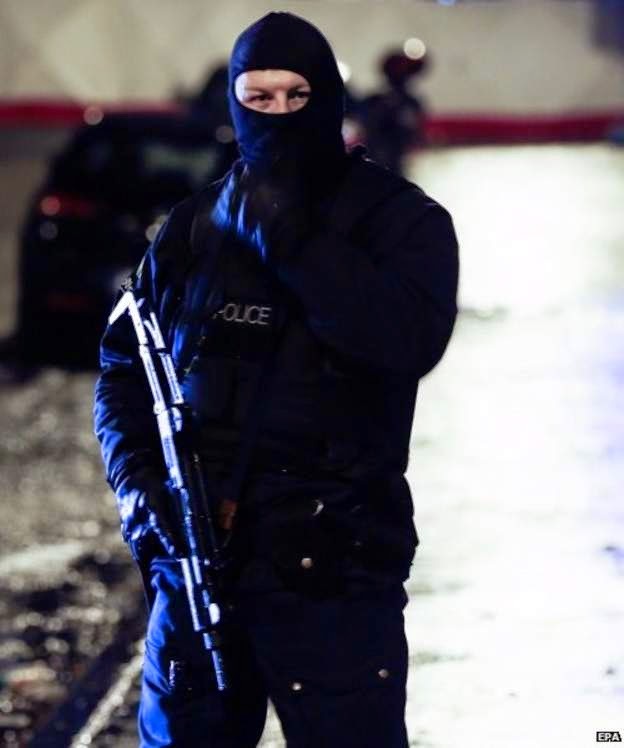 Anti Islamist Terror Operations Sweep Across Europe. 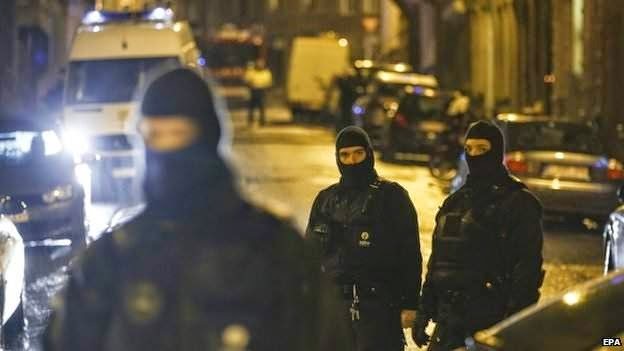 A special security squad of the Belgian police in an anti terror operation moments ago raided at an old bakery in Verviers. Two suspects have been killed. We are keeping you posted as more news becomes available. Raw footage of an anti terror situation in Verviers, Belgium, close to the German border. UPDATE: The Mayor of Antwerp is deploying army units to help guard to city tomorrow, made possible by threat level 3 which makes extra security demands on the police services. Brussels is contemplating similar measures. Antwerp has a large Jewish population. During the raids yesterday 13 people have been arrested. Two suspects in France will be extradited to Belgium. The suspect apprehended at the shoot out in Verviers - the 25 year old Marouane N. - is denying involvement. He says he was in the building for a drugs deal. The suspects are accused of conspiring to abduct a policeman or a judge for decapitation. Two raids as part of an anti terror operation against Jihadists who returned from Syria. Two suspects were killed, one wounded who is under arrest. All were Belgian nationals. The threat concerned an imminent 'large' attack on the police services. 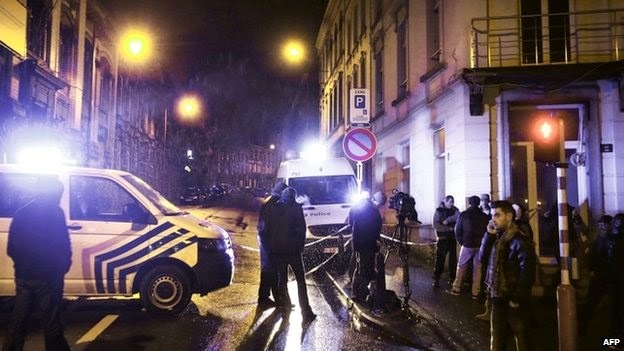 There have been dozens of raids today in various residences in Brussels, Verviers and Halle-Vilvoorde. Two other suspects were apprehended in Brussels earlier in the morning. A similar operation took place in Yemen. In Wolfsburg Germany a 16 year old German of Tunisian descent was arrested. According to the authorities there's no link with the Paris attacks. Main Jewish schools will be closed tomorrow. The army is on stand-by. Next presser tomorrow morning 11:00 l.t. PRESSER: POLICE HAVE RAIDED AN OLD BAKERY IN VERVIERS OF GROUP THAT WAS PLANNING AN IMMINENT TERRORIST ATTACK. BELGIAN AUTHORITIES HAVE RAISED THE TERROR ALERT TO LEVEL THREE. Witnesses are describing a series of explosions followed by rapid fire at the centre of Verviers, near a bakery and in the area of the train station.